This hunt started on Dec 28th but my quest for a lion started 4 years ago. It was February of 2006 and my son Tyler was 10yrs old at the time. I wanted to take him on a big game hunt but since he was only 10 I wanted to pick a hunt that would be exciting for him. I thought about deer and antelope but the sitting may get boring for someone his age so after careful consideration I chose a cougar hunt. 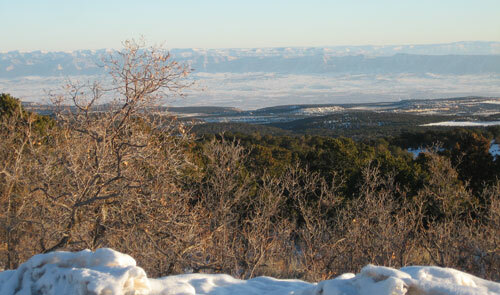 I booked a 7 day hunt out of Flagstaff AZ. It was a dry-ground hunt and we were on cats the entire time, but we just couldn’t get the job done. It wasn’t from lack of effort, we put so many miles on that hunt that my son blew out his shoes! Despite not getting a cat on that trip we weren’t about to give up. After doing some research I picked an outfitter that I’d heard good things about. 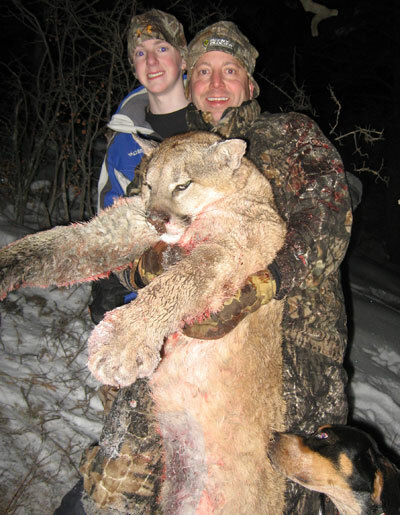 We booked our next cougar hunt for January 2008. It was A 5 day hunt with the option to add 2 extra days if needed. We hunted long and hard for 5 days and never cut a fresh track. So we opted not to add- on the 2 additional days. After 2 unsuccessful hunts, my son and I wanted a cat more than ever wanted. But now I was gun-shy. 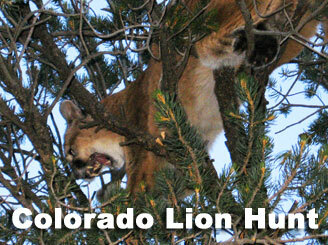 We had already spent 12 days hunting Mt Lion and nothing would go our way. You always hear those stories of guys who shot their cat on the first day of their hunt, or that the outfitter treed multiple lions. So I knew there were good outfits out there, we just needed to find the right one. I started researching the internet here on Bowsite.com, talking to friends that had taken a cougar, and talking to reputable booking agents. I met with several but was still afraid to commit. Then I received info from an outfitter in Western Colorado. His name was Steve Biggerstaff and he was running a success rate of 95% and taking multiple Boone & Crocket cougar every year. After talking to him I knew this was the guy I was going to hunt with. Outfitting for Cougars is his life, he specializing in breeding and training hounds. He is set up for any type of conditions. He has UTV’s and snowmobiles and he also runs horseback hunts in the spring. I booked the hunt with him 11/2 years in advance. Tyler, now 14, could not miss school so I booked the week between Christmas and New Years’ for our cat hunt. During our layover in Salt Lake City, I had a voice message from Steve. His guide Cliff would be meeting us at the airport because he had found a track from a big tom. No sooner had we landed in Denver and met Cliff, when he got a phone call from Steve telling him to head up to the mountain. He had just let his dogs loose on a tom and was going to need our help. We headed straight for the mountain. In no time at all we arrived and could hear the dogs barking. We hadn’t been off the plane so much as an hour! By the sound of the dogs they had treed a cat off in the distance. Tyler and I had to jump in the back of the truck, open up our suitcase, and change into our hunting cloths. We started up the mountain and after just a half mile we were at the tree. The dogs had a 100lb female treed. This was very cool. Tyler and I had not been off the plane 2 hours and we already saw a Mt Lion! 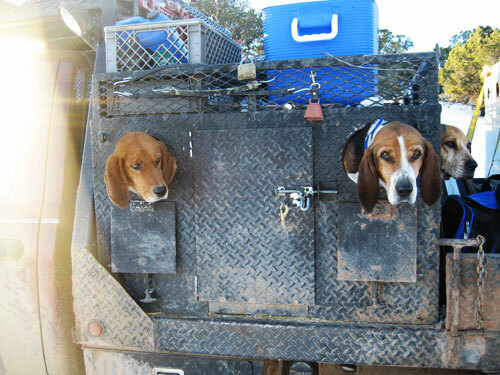 After some pictures and video we gathered up the dogs and headed back to the truck. Not bad given our hunt had not even started yet. We left the house at 6:30am and headed to the mountain in search of tracks. Within 20 minutes Steve found the first track of the day. It was a fresh track from last night but it like a female so we kept going. 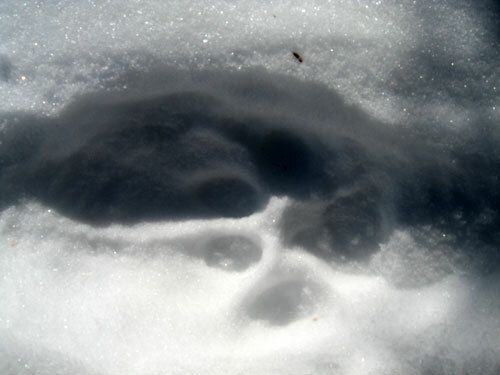 We continued higher and found a few more sets of tracks. They all appeared to be a couple of days old. We then headed to a different area. The plan was to drop off our guide Cliff, and have him cut a canyon with a UTV. Steve, Tyler, and I took the truck and cut a different area before we picked up Cliff at the back end of the canyon. About a half hour into the plan Cliff cut a big track. He was not sure how old it was so we all headed over to meet up with him and check it out. According to Steve he guessed it was 2 days old. We combed the area looking for a fresh track but couldn”t find one. Steve was tempted to let the dogs loose but it was 1:30pm and there was only one way into this area. We decided to come back tomorrow and spend the rest of the afternoon checking the direction the tracks were headed. It was then that we got a call from Cliff. We loaded up the Rhino’s and headed toward the other area. Steve noticed a bunch of crows flying around in the trees so we slowed down to check for tracks crossing the road. We didn’t go a few hundred yards and Steve stops the truck. I see him raise his arms and says “big tom.” He walked into the woods a short ways and when he returned he says to me “Get the camera rolling”. A couple minutes he let all the dogs out and they were off and running. The time was 2:30 pm when Steve grabbed his pack and headed off after the dogs. He told us to stay at the truck for now and would call us. After a 45min wait Steve radio’d and told us the dogs were heading in a certain direction and see if we could head them off. The road was about 5 miles away. We drove to that area and listened for the dogs. We could faintly hear them so we parked the truck and called Steve to tell him the dogs had treed about a mile down the mountain. By this time the sun was setting and I was hoping we could get to the tree with enough light. We grabbed our packs and my bow and raced down the mountain in the direction of the dogs. When we reached the tree there was a Cougar 30ft above. We called Steve who told us he’d be there in 10 minutes. Cliff suggested that we wait for him the only problem was it was starting to get dark. Steve called on the radio and told us he was almost there. Suddenly one of the dogs which had made it’s way up into the tree with the cat - got too close. The cat swiped at the dog and caught him. I could see the dog suspended in the air - hanging from the cat’s claws. The dog broke loose and fell 25ft to the ground. I then asked Cliff if I should shoot it due to the situation and the fading light. He said yes. With my son Tyler behind me with the video camera rolling I shoot the lion. It jumps from one side of the tree to the other. I nocked another arrow and I shoot again. I put a 3rd arrow on and ask Cliff if I should shoot again? He said yes so I shoot the lion a 3rd time. Shortly after my third shot the cat died in the tree. We were pretty excited. After three trips I finally got my cat and did it all with my son Tyler right there with me. 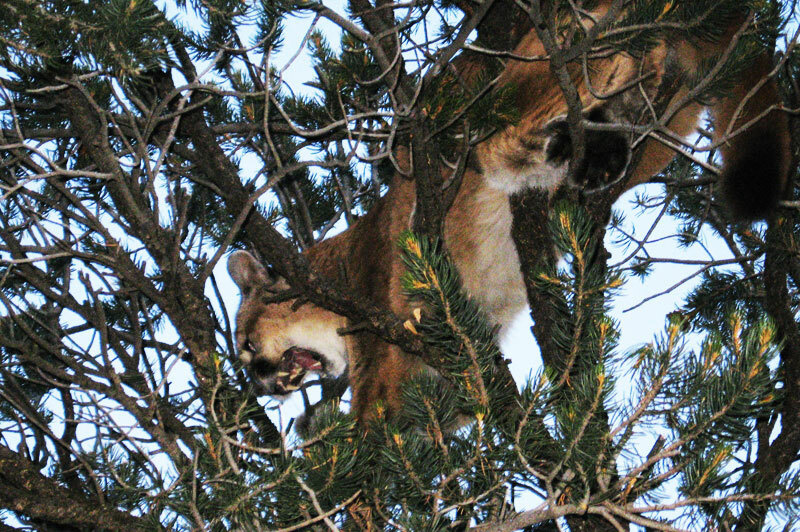 Steve made it to the tree a few minutes later and was understandably disappointed to have missed the action. We took some photos and made a fire to warm up Tyler before skinning my lion right there on that quiet Colorado Mountain. While my final cougar hunt was extremely short, it was still a terrific experience - one we won’t soon forget.